In my experience, sun can usually be guaranteed at the Cannes Film Festival. Yet new arrivals on the Croisette today were greeted by buffeting gusts, sharp showers and glowering clouds more reminiscent of a wet weekend in Margate. Here’s hoping it’s just the storm before the calm. With the festival kicking off tomorrow, the atmosphere is one of nervous excitement and frantic, last-minute preparations. I trust they’ll get round to laying a red carpet on the steps of the Grand Theatre Lumiere, which, at the moment, look rather naked without it. That said, they have found time to drape the usual, enormous billboards over the hotel frontages that overlook the Mediterranean. The Carlton, for example, has massive representations of Sylvester Stallone, Harrison Ford and other cast members from The Expendables 3 ahead of their planned visit this weekend. Other displays bang the drum for Angelina Jolie’s Maleficent, the new Transformers film and the next entry in the Hunger Games franchise. 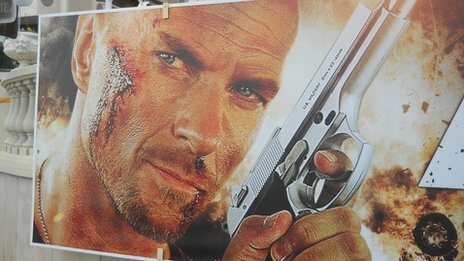 The one that caught my eye, though, is for a film called Awol 72, an action thriller starring Luke Goss of Bros fame. According to the poster tagline, “Running is the only option”. Well, I suppose that’s one way of putting it.